Sweet Indulgences by Anne - Baking, cakes, deserts, catering and more for the Cornwall, Ontario and SD&G area. Anne Donkers creates the best looking and tasting cakes around! A Mother, wife, baker & business woman! Anne Donkers grew up in Williamstown, a small close knit community in Eastern Ontario. Anne started to work in the retail business after graduating from Char-Lan high school. She married Bob Donkers from Branchton, ON., and within four short years they were the proud parents of three children. For the past 23 years they have made Williamstown their home. Anne is a very active member of the Optimist club of Lancaster. She loves to work with children and adults for the betterment of the community. Anne started her baking career when she was only 10 years old. Working alongside her “nana” who taught her the tricks of the trade, Anne’s love of baking grew. Anne continued learning and growing with 4-H classes until she was in her teens. Once married, she began teaching the 4-H program, life skills division. This was her way to give back and to encourage the younger children in the art of culinary skills. 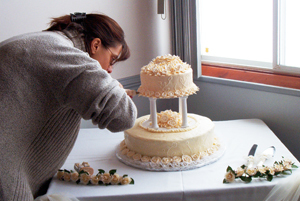 After taking a cake decorating course at Conestoga College, Anne found her true passion. For the past 20 years she has created cakes that are works of art. From children’s themed birthday cakes, anniversary, retirement to elaborate wedding cakes, Anne has done them all. Not only do they look fabulous, they are decorated to your specifications, and taste delicious too. All are freshly baked with that personal touch and lots of love. Anne is putting the final touches to a very special cake. Her latest endeavour is making 3-D cakes. You own a trucking company…how about a Transport truck cake? All edible. Welcome to your new home… how about your new house in cake right down to the street number on your porch! Maybe a Gucci purse for that “sweet 16” birthday coming up. Anne and her team look forward to creating master pieces for you.